(...) Central to this work particularly are two dozen late Gothic sculpturess that were probably originally shrine figures for private or communal piety. In time they found there place in the museum and are now valued as artworks. It is to these images, torn from their web of contextual meaning, that Simon Beer leads five Swiss authors. The word people were given the task of reflecting on the world of images and making their thoughts accessible to the public. As a second word level, the «philologist» Simon Beer introduces literature contemporary or nearly so to the world of the sculptures. Themes ranging from spirituality to physis are offered in lyrical and prosaic texts and these often frugal yet sensuous expressions are contrasted with modern works. A third level is introduced in the clear voices of Medieval spiritual music. The museum visitor thus lands between a world of images and a world of words. 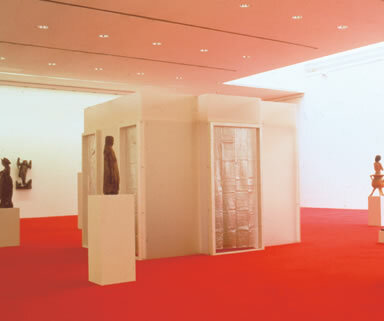 He or she encounters the familiar sculptures, normally located as core pieces in the museum's permanent collection, now placed in a grid situation surrounded by a central contemporary hermitage. Six loci conclusi, real cells, afford willing observers a new approach to these works seemingly so completely researched by art historians and comprehended on a feeling level. The idea cannot be disqualified, that through meditative listening and seeing, a relationship to these sculpture ensues that approaches its original intent. 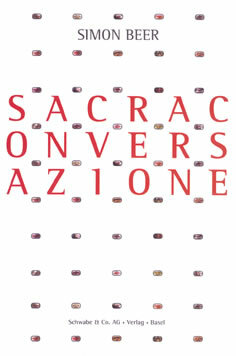 Both exhibition and book Sacra conversazione are independent units. The temporary presentation can be viewed as an experiment carried further by the interdisciplinary collaboration in the substantial publikation. The sound of music and words find their resonance in Simon Beer's design for the printed work. From left to right: Maria Aegyptiaca (ca. 1480), St. Agnes (early 16th c.), Maria with child (ca. 1170). Detail "loci conclusi" (6 booths, wooden constructions with plastic panels, shower curtains, and seating space). 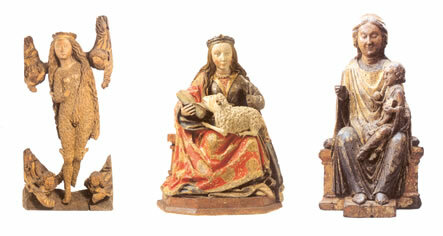 Left: female saint, Rhine area, 14th c. (BERG Architekten, Zurich). "Sacra Conversazione", Schwabe Verlag, Basel, Simon Beer, Ed. Part 1: art historical essays by Prof. Dr. Ulrich Schneider, Prof. Dr. George L. Hersey, Prof. Dr. Theresa Georgen and Dr. Sybille Laemmel. 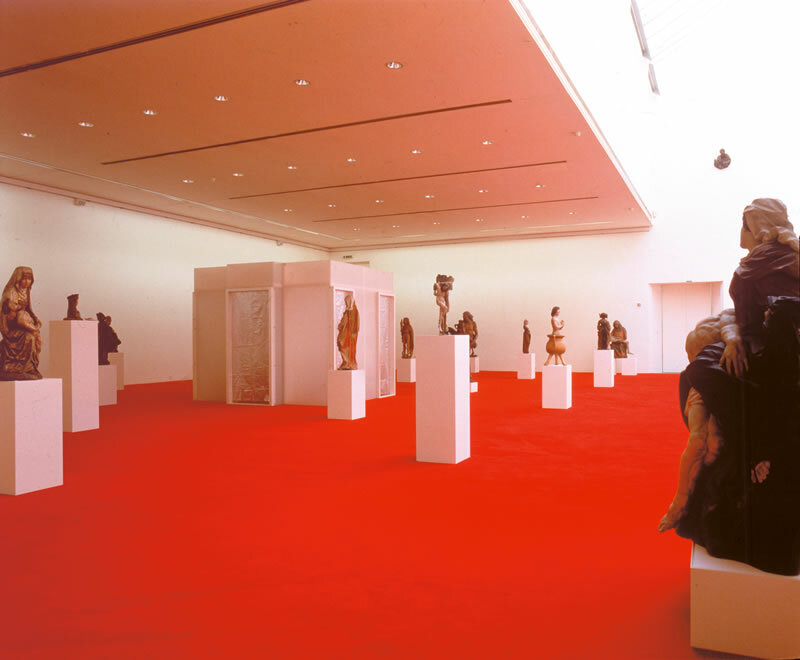 Red carpet, 25 medieval sculptures (12th - 17th c. from the museum collection), bases, architectural element with 6 plastic and wooden "cells," contemporary and medieval texts, music (15th c.).